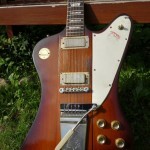 The 1972 Gibson Firebird medallion limited edition is one of the great Gibson guitars from the 1970ties. 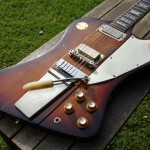 It is an accurate reissue of the original reverse Gibson Firebird V manufactured from Spring 1963 till mid 1965. 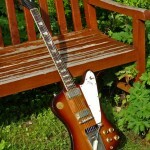 The look of the Gibson Firebird is very unique, like a more rounded Gibson Explorer shape or an enlarged and flipped over Fender Jazzmaster. 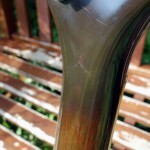 Also the construction with the middle piece of the body and the neck made from long pieces of laminated wood is only used on this guitar type. 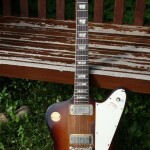 The original Gibson Firebird was built in several versions (I,III,V and VII) which differ in the number of pickups, the fretboard material and inlays and the tailpiece. 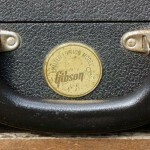 The model was generally equipped with a special type of mini humbucking pickups, except some late transition models which were equipped with single coil P-90 pickups. The short lived model was in 1965 substituted by the non-reverse Firebird. 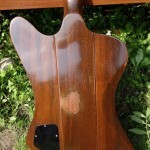 The decision for this change may be a combination of lack of success (approximately 4000 reverse Firebird were produced) and a dispute with Fender about a similar body design to the Fender Jazzmaster/Jaguar. Funny that the non-reverse Firebird looks even more like a Jazzmaster. What really caught my attention on Gibson Firebird’s was the playing of Johnny Winter in the late 70ties and early 80ties. 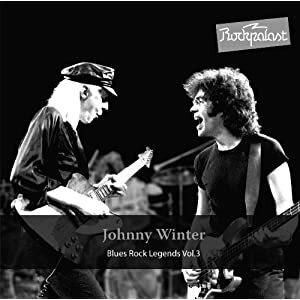 At this time it was not easy to get a Firebird or Firebird-Style guitar because they weren’t produced anymore (by the way to play like Johnny Winter is also not an easy task…). The opportunities were to buy an original reverse model, a 1972 medallion reissue or a 1976 Bicentennial reissue (or a Ibanez reissue). At that time a Firebird was rare and expensive (f.e. a fender strat 63 was approximately 2.500 DM and a Firebird III from 1964 was 4.000 DM). 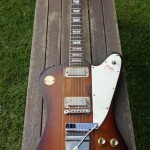 Though my first Firebird was a nice 1976 Bicentennial reissue, followed by 1963 Firebird III in completely rocked condition and last but not least the 1972 Gibson Firebird medallion. 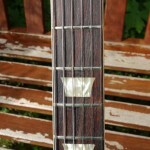 The neck feels long but with a perfect access to the upper frets. 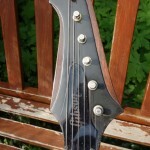 The Gibson Firebird is not balanced very well hanging on a strap – it is neck/headstock heavy. 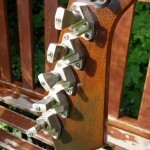 The guitars a prone to headstock breaks (as in this case). The mini humbuckings have a clearer tone then a full size humbucking pickup, making this guitars sound somewhere in between a classic Gibson and a Fender guitar. 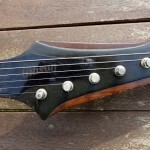 The balance of the pickups on the 2 or 3-pickups is seldom fine. 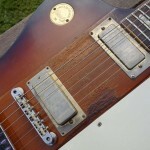 The neck pickup often sounds awesome, but the bridge pickup often sounds thin like belonging to another guitar. 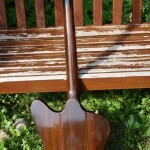 The pickups on this particular guitar are fine and very well balanced, which is a rare find. 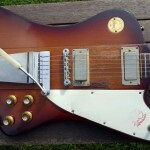 This is my personal No.1 Firebird which took me over 10 years to find. This entry was posted in gibson on 3. October 2012 by admin.